یوسفی, محمد, قاضی زاده, مصطفی. (1397). مروری بر مدل‌های بین المللی‌سازی شرکت‌ها. بررسی‌های بازرگانی, 16(شماره 90-91), 23-39. محمد یوسفی; مصطفی قاضی زاده. "مروری بر مدل‌های بین المللی‌سازی شرکت‌ها". بررسی‌های بازرگانی, 16, شماره 90-91, 1397, 23-39. یوسفی, محمد, قاضی زاده, مصطفی. (1397). 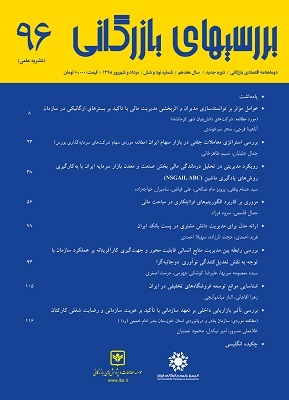 'مروری بر مدل‌های بین المللی‌سازی شرکت‌ها', بررسی‌های بازرگانی, 16(شماره 90-91), pp. 23-39. یوسفی, محمد, قاضی زاده, مصطفی. مروری بر مدل‌های بین المللی‌سازی شرکت‌ها. بررسی‌های بازرگانی, 1397; 16(شماره 90-91): 23-39. افزایش حجم تجارت جهانی و تغییرات مربوط به آن‌ در محیط اقتصادی کشورها سبب افزایش رقابت در کسب و کارها گردیده و بین‌المللی‌سازی را به یکی از مؤلفه‌های اساسی استراتژی‌های کسب و کار در بسیاری از شرکت‌های جهان تبدیل نموده است. تا‌کنون تلاش‌های بسیاری برای درک این فرایند صورت گرفته و تعاریف زیادی نیز برای بین‌المللی‌سازی شرکت‌ها ارائه شده است. بین‌المللی‌سازی شرکت‌ها یکی از موضوعاتی بوده است که در سال‌های اخیر توجه بسیاری از محققان را به خود جلب کرده و در طول زمان نیز مدل‌های بسیاری برای تبیین این فرایند ارائه شده است. علی‌رغم تفاوت‌های موجود در این نظریه‌ها، مدل‌ آپ‌سالا، مدل‌های I و مدل رفتارهای پیش از صادرات بر فرایندهای داخلی شرکت‌ها برای رسیدن به اهداف بین‌المللی‌سازی تمرکز دارند ولیکن مدل‌های شبکه‌ای به دنبال توصیف فرایند بین‌المللی‌سازی شرکت‌ها بر اساس ایجاد و حفظ روابط با سایر شرکت‌ها هستند. هدف از نگارش این مقاله ارائه تصویری کلی و شفاف از مدل‌های بین‌المللی‌سازی و هم‌چنین بیان تفاوت‌های موجود بین این مدل‌ها می‌باشد. Andersen, O. (1993). On the internationalization process of firms: A critical analysis. Journal of international business studies, 24(2), 209-231. Arregle, J. L., Duran, P., Hitt, M. A., & Van Essen, M. (2017). Why is family firms’ internationalization unique? A meta-analysis. Entrepreneurship Theory and Practice, 41(5), 801-831. Arregle, J. L., Miller, T. L., Hitt, M. A., & Beamish, P. W. (2018). The role of MNEs’ internationalization patterns in their regional integration of FDI locations. Journal of World Business. Beamish, P. W. (1990). The internationalization process for smaller Ontario firms: a research agenda. Research in global business management, 1, 77-92. Calof, Jonathan L., and Paul W. Beamish. “Adapting to foreign markets: Explaining internationalization.” International business review 4, no. 2 (1995): 115-131. Chetty, S., & Holm, D. B. (2000). Internationalisation of small to medium-sized manufacturing firms: a network approach. International business review, 9(1), 77-93. Christofor, J. (2008). Antecedents of Venture Firms’ Internationalization: A Conjoint Analysis of International Entrepreneurship in the Net Economy. Springer Science & Business Media. Coviello, N., Kano, L., & Liesch, P. W. (2017). Adapting the Uppsala model to a modern world: Macro-context and microfoundations. Journal of International Business Studies, 48(9), 1151-1164. Efrat, K., & Shoham, A. (2012). Born global firms: The differences between their short-and long-term performance drivers. Journal of World Business, 47(4), 675-685. Farooqi, F., & Miog, R. (2012). Influence of Network forms on the internationalization process: A study on Swedish SMEs. Fina, E., & Rugman, A. M. (1996). A test of internalization theory and internationalization theory: The Upjohn company. MIR: Management International Review, 199-213. George, G., Wiklund, J., & Zahra, S. A. (2005). Ownership and the internationalization of small firms. Journal of Management, 31(2), 210-23Ghanat-Abadi, Firouzeh. “Internationalization of small and medium-sized enterprises in Iran.” PhD diss., Luleå tekniska universitet, 2005. Håkanson, L., & Kappen, P. (2017). The ‘Casino Model’of internationalization: An alternative Uppsala paradigm. Journal of International Business Studies, 48(9), 1103-1113. Hollensen, S. (2007). Global marketing: A decision-oriented approach. Pearson education. Johanson, J., & Mattsson, L.-G. (1988). Internationalization in industrial systems—a network approach. In N. Hood, & J.-E. Vahlne (Eds. ), Strategies in global competition (pp. 303–321). New York: Croom Helm. Johanson, J., & Vahlne, J. E. (1977). The internationalization process of the firm-a model of knowledge development and increasing foreign market commitments. Journal of international business studies, 23-32. Johanson, J., & Vahlne, J. E. (2003). Business relationship learning and commitment in the internationalization process. Journal of international entrepreneurship, 1(1), 83-101. Johanson, J., & Vahlne, J. E. (2009). The Uppsala internationalization process model revisited: From liability of foreignness to liability of outsidership. Journal of international business studies, 1411-1431. Johanson, Jan, and Jan-Erik Vahlne. “The mechanism of internationalisation.” International marketing review 7, no. 4 (1990). Leonidou, L. C., & Katsikeas, C. S. (1996). The export development process: an integrative review of empirical models. Journal of international business studies, 27(3), 517-551. Melin, Leif. “Internationalization as a strategy process.” Strategic management journal 13.S2 (1992): 99-118. Ojala, A. (2009). Internationalization of knowledge-intensive SMEs: The role of network relationships in the entry to a psychically distant market. International business review, 18(1), 50-59. Oviatt, B. M., & McDougall, P. P. (1994). Toward a theory of international new ventures. Journal of international business studies, 45-64. Raynard, P., & Forstater, M. (2002). Corporate social responsibility: Implications for small and medium enterprises in developing countries. Schwens, C., Zapkau, F. B., Bierwerth, M., Isidor, R., Knight, G., & Kabst, R. (2018). International Entrepreneurship: A Meta–Analysis on the Internationalization and Performance Relationship. Entrepreneurship Theory and Practice, 42(5), 734-768. Sharma, D. D., & Blomstermo, A. (2003). The internationalization process of born globals: a network view. International business review, 12(6), 739-753. Vahlne, J. E., & Johanson, J. (2002). New technology, new companies, new business environments and new internationalisation processes?. Vahlne, J. E., & Wiedersheim-Paul, F. (1973). Economic distance: model and empirical investigation. Export and foreign establishments, 81-159. Vahlne, J. E., & Wiedersheim-Paul, F. (1977). Psychic distance: An inhibiting factor in international trade. CIF. Welch, L. S., & Luostarinen, R. (1988). Internationalization: Evolution of a concept. Journal of general management, 14(2), 34-55. Wiedersheim-Paul, F., & Johanson, J. (2017). The internationalization of the firm—four swedish cases 1. In International Business (pp. 127-144). Routledge. Wiedersheim-Paul, F., Olson, H. C., & Welch, L. S. (1978). Pre-export activity: The first step in internationalization. Journal of International Business Studies, 47-58.